Crossman, Bruce. “Living Breath, Juxtapositional Flow and Emergent Spirit: Asian Music Festival 2014 in Yokohama and Tokyo,” Resonate Magazine, 19 Nov 2014, ed. Anni Heino, Australian Music Centre. Crossman, Bruce. “Living colours – from Chinese opera to an Australian music theatre work,” Resonate Magazine, 12 Jun 2013, ed. Anni Heino, Australian Music Centre. Crossman, Bruce. 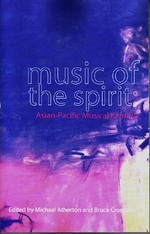 “Space, Silence and Sound: Asian Music Festival 2010 in Tokyo,” Resonate Magazine, 2 Nov 2010, ed. Anni Heino, Australian Music Centre. Crossman, Bruce. “Ring of Fire: Six Australians in Tongyeong and Seoul,” Resonate Magazine, 8 May 2009, ed. Anni Heino, Australian Music Centre. Bennett, Gwen. “Living Colours: Pacific Sounds and Spirit – Music by Bruce Crossman,” The Music Trust, Loud Mouth, Australia, July 3, 2017. Applegate Edwards, Grego. “Bruce Crossman, Living Colours: Pacific Sounds & Spirit,” Gapplegate Classical-Modern Music Review, USA, May 18, 2017. Noble, Alistair. “Shadows and Silhouettes: new piano compositions celebrating a Chinese-Western confluence,” The Music Trust, Reviews, Dec 1, 2014. Nightingale, James. “Gentleness-Suddenness, Bruce Crossman,” Partial Durations, Realtime, e-dition, Jul 4 2013.